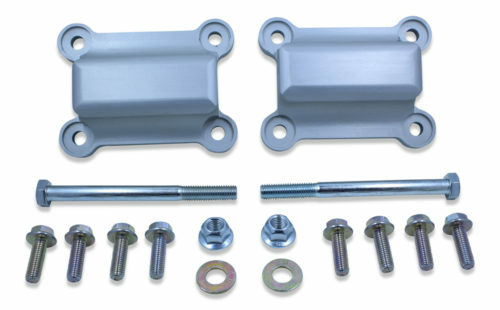 These lightweight billet aluminum solid motor mounts for the 1998-2002 GM F-Body Camaro and Firebird are a direct replacement of the factory rubber motor mounts for maximum performance. They control excessive engine movement, eliminate the need for torque straps, and prevent linkage binding. Lock that LSx power into place with a set of our lightweight billet aluminum solid motor mounts. Besides the gains you’ll achieve with keeping the horsepower locked into the saddle, you’ll save three pounds of weight off of the front end as well. These motor mounts are CNC machined from 6061 aluminum and feature a clear hard anodized finish for corrosion protection and a really trick look. We even include all new Grade 10.9 mounting hardware for bolting them to the engine block and the through bolts at the k-member/frame connection. We recommend using these in conjunction with a polyurethane transmission mount (not a solid). These can be used on 1993-1997 GM F-Body cars that have swapped in a LSx k-member and are swapping in a LSx engine. These can be used for LSx swaps into other vehicles using motor mount adapters that work in conjunction with 1998-2002 GM F-Body LSx engine block motor mounts like our Part# 971 LSx swap adapter mounts. The overall mounting width of these solid motor mounts is 4.33″ with a 12mm through hole. These will bolt on to any LSx based engine (LS1, LS2, LS3, LS4, LS6, LS7, LS9, LSA, LR4, LM4, LM7, L33, L59, LQ4, LQ9, L76, LY6, LY2, L20, LH6, LY5, LMG, LC9, LH8, L92, L99, etc.). Click here to check out all of our performance products for the 1998-2002 GM F-Body!